Together, Sr. Helga Gabriela Haack, Sr. Marie-Therese Brodmann and Sr. Veronika Sube had prepared for the final profession. 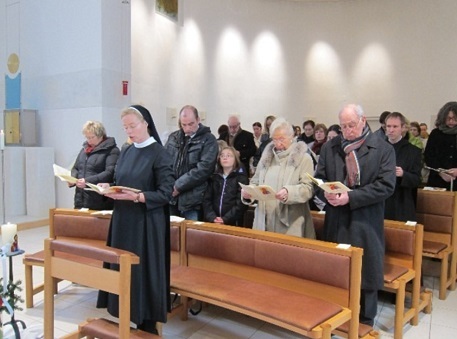 Since Sr. Veronika had begun her juniorate later, she had to wait with her final profession until December 15, 2013. It was Gaudete Sunday, a day that could not have fit better. 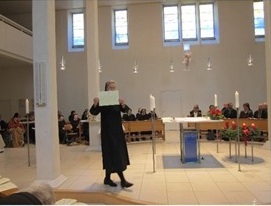 Many shared this joy with Sr. Veronika and joined the celebration: Sisters from all the houses of the Tutzing Priory, relatives and friends from the far north of Germany and also former and actual workmates from Munich and the clinic of Feldafing, where Sr. Veronika works as a hospital chaplain. In his homily, Father Heio Weishaupt, a friend of Sr. Veronika, explained the elements and symbols of the profession rite. This allowed the guests to well follow and understand the meaning of the celebration. 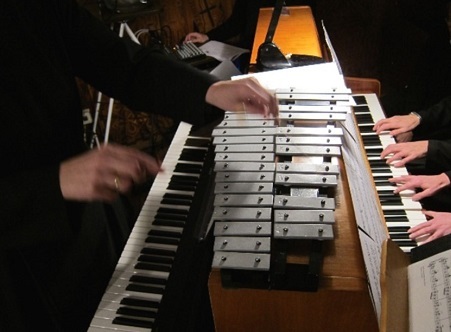 Sr. Veronika had chosen Advent songs and sisters and guests had prepared wonderful musical arrangements with instruments and voices. After the celebration the guests and sisters were invited to have lunch together in our hall. Then, many guests participated in a guided tour through the monastery which was offered to them. 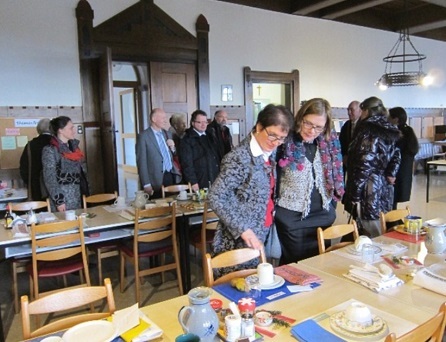 In the afternoon, guests and sisters met again for coffee and cake in the hall. During Vespers Sr. Hildegard Jansing spoke on the reading from the second letter to the Corinthians from which Sr. Veronika has chosen her profession verse, Yes has been in HIM. “She led among other things to the fact that in our world the clear and firm “yes” has become less usual than the “yes but” or the “yes-no”. We often use many excuses to keep the doors open, to delay or evade a clear decision. Very different from this attitude is the experience of Christmas, where God’s yes is realized in Jesus. This, Sr. Hildegard said, is the proclamation of great joy. Against all no sayers of the world God finds his place in this world, not just in the manger, but in the hearts of the people. And, Sr. Hildegard concluded, because God’s “yes” is firm, Sr. Veronika can dare her personal “yes” to her life of following Jesus in our community.